Best Of’s get a bit of a bad rap. There’s something just a little Motorway Service Station at 2am about a Greatest Hits. They’re for the Eagles, the Two Ronnies, Sting. So it’s no surprise that arch-mystifier Derren Brown has brought something a little extra to the mix, as he plays through a setlist of unwavering bangers while all the time crafting something greater, smarter and spookier. Framed around six great secrets which Brown sets out to explain, this confusingly titled evening offers astonishment after astonishment, with a minimum of fuss and barely a brush of bombast. Brown looks more comfortable than ever in his raffish and understated stage-persona, a million miles away now from the brooding mind-manipulator who made his break-through TV and stage shows a decade and a half ago. There’ll be no spoilers here, but it’s a joy to see the Oracle act from 2007’s An Evening of Wonders return. There’s the astounding and moving box trick from 2009’s Enigma and a smattering of material from Svengali and Infamous. Confined to the killer, Brown can leave the filler at the door, so there’s no need for some of the more conventional feats that usually pad out the first half of his shows, and instead trick after trick lands to an audience of dropped jaws and sharp intakes of breath. 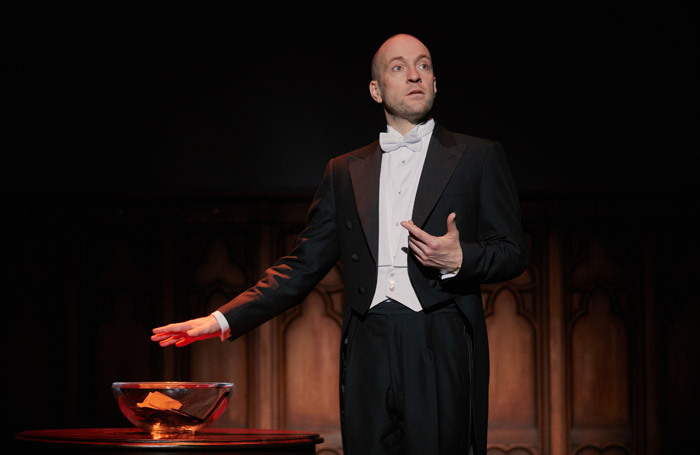 It’s Derren Brown at his very, very best – a magician on unimpeachable form.